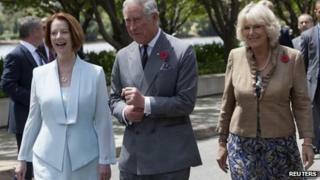 The Prince of Wales's Diamond Jubilee tour of Australia has gone "delightfully well", the country's prime minister Julia Gillard has said. The prince and the Duchess of Cornwall have spent six days in Australia, ending their visit in the capital Canberra before heading to New Zealand. They also attended a reception at Sydney Opera House on Friday, hosted by the governor of New South Wales. The royals are on a two-week Diamond Jubilee tour of Commonwealth countries. Ms Gillard has returned to Australia after co-chairing a democracy forum in Bali, Indonesia. She said: "I've been overseas myself so I've been watching from on far, but it seems to have gone delightfully well." She welcomed the prince and duchess when they arrived at a crowd-lined thoroughfare in Canberra, where the royal couple renamed a section of road Queen Elizabeth Terrace. Speaking at the renaming event, Ms Gillard said: "This place will be a lasting tribute to Her Majesty the Queen on the occasion of her Diamond Jubilee, inscribed forever in the architecture of our capital. "It will remind future generations that for more than half our journey as a united nation Elizabeth II has been our monarch. "No-one in the history of our federation has shared more consistently in the affairs of our Commonwealth or followed them with deeper interest and goodwill. "As Canberra prepares for its centenary it is fitting that the Queen's life of duty is given recognition here in our nation's heart, and her wisdom and dignity are honoured among the people she has so faithfully served." The royal couple then went on a brief walkabout in the newly-named terrace. The prince and duchess later held a private meeting with the Queen's representative in Australia, Governor General Quentin Bryce and her husband Michael. Prince Charles then held a series of talks in Government House, with Ms Gillard and then the leader of the opposition, Tony Abbott. A Diamond Jubilee buffet lunch was held in the building's grounds, and during a short speech the prince praised the volunteering efforts of many Australians. Charles, who said he and his wife would leave Australia with "great sadness", said: "These are the people of course who provide a glue to such a, I think, diverse and energetic and determined society. "And from that point of view it has been a real joy for my wife and I to help celebrate that wonderful aspect of society in Australia. "To pay a tribute, for what it's worth, to all these marvellous people, and to just thank them for all they do to make Australia such a very special place." Before they left for New Zealand, the royal couple paid their respects to Australia's war dead at the national memorial on the eve of Remembrance Sunday. The prince laid a floral tribute at the monument, honouring more than 100,000 service personnel who have died serving Australia - a Commonwealth country - since World War I. The pair also listened to the Last Post played by a bugler inside the Hall of memories and observed a minute's silence - held after the prince placed a large wreath at the tomb of a World War I serviceman. So far on their trip, the royals have visited a village in Papua New Guinea, travelled to the Australian Outback and had a day at the races, visiting the Melbourne Cup, among other engagements. It is the first time the duchess has visited Australia, but the prince lived there in the 1960s, studying at Timbertop school in Melbourne, Victoria.